Includes 100 chat bubbles with various color variations, license. You don’t see enough speech bubbles in art and design these days! And it’s a shame really because speech bubbles saw some glorious days with comics, newspaper and magazine cartoons. But there always comes a time when you need a chat bubble and you don’t have one that fits your project nicely. And it isn’t always easy or you just don’t have the time to design one right there when you need it. We’ve all been there. 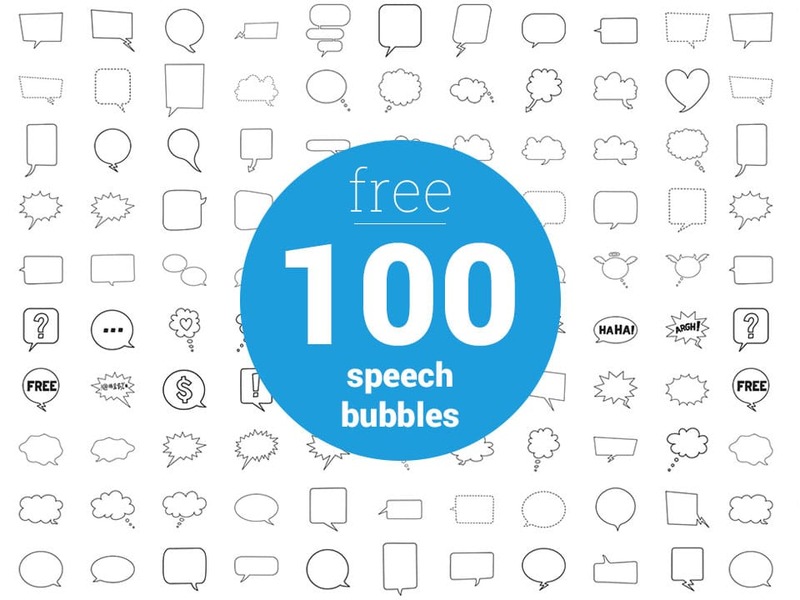 Which is why we created not one, not two, but a hundred free speech bubbles for you to download. We also created 5 additional styles with shadows and strokes, so the total number of bubbles you’ll be downloading today is actually 600. You heard that right. Just like with all our premium clipart, feel free to use our work in your personal, editorial or commercial projects, including those you charge the end-users for. And to top it all off, attribution is NOT needed. But hey, we would obviously do the crazy dance if you happen to give us credit so that’s something to think about, right? Seriously though, it is completely up to you. Just one thing. You are not allowed to resell, redistribute or give them away for free. Nor as provided nor as you modified them. And it goes without saying all illegal uses are prohibited. For more information, please read our license and contact us if you’re still in doubt after having done that. Please feel free to repeatedly use these speech bubbles (or any variations you create) in as many end-projects as you like, including those you charge the end-users for. Your download includes 2000px large PNG files, vector PDF, and EPS, as well as editable vector PSDs. If you are even slightly familiar with Photoshop or similar applications, you will be able to easily change strokes and fill colors and create your very own variations. Last but not least, you will be able to resize them within Photoshop without loss of quality – just like you would resize a normal shape. Simply click the button below to begin the download. Hope you enjoy your free speech bubbles!